Yolanda Ridge, the lovely and talented author of Trouble in the Trees and Road Block, has tagged me in the My Writing Process Blog Tour. It’s only natural she picked on me, as I’m pretty sure we are twins separated at birth. We’re both Canadians who have applied our graduate degrees in science to careers as children’s writers, and on the day we finally meet outside of the internet, it is going to be epic. Go make her virtual acquaintance – she’s great! 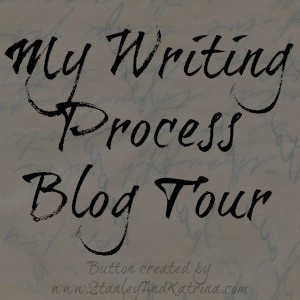 Here’s how My Writing Process Blog Tour works: once tagged, you answer four questions about the writing process and then tag three other authors. The rules don’t specify whether the tag should be of the ear or radio collar variety, but I’ve provided web links so the online stalking (of the fangirl variety only, of course) can begin. At the moment, I’m working on two books about forensics. Fuzzy Forensics: DNA Fingerprinting Gets Wild is in layout right now, which means that I look at stuff the illustrator (Nicole Wong) and designer (Michael Penman) have done and wave my royal stamp of approval (it’s sparkly and uses chocolate ink). Sometime I make suggestions, but mostly those two are brilliant and get by without my help. 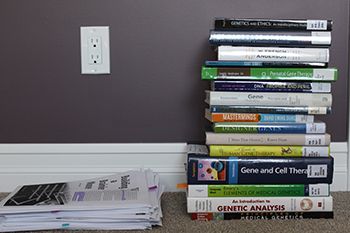 The second forensic book is for an educational publisher, and I’m alternating between writing and editing the first chapter and doing research to complete the outline for the rest of the book. This involves reading way too many descriptions about gruesome murders and trying to figure out how mature is too mature for a book aimed at teenagers. That’s all for me! But check out these awesome writers, who will be posting their own responses in the next week or so. Ishta Mercurio, critique partner extraordinaire. Not only is she a genius with a red pen, she’s celebrating her soon-to-be released first children’s science book, Bite Into Bloodsuckers! In addition to checking out her blog, spend some time on her highly entertaining YouTube channel, Ishta Vlogs. Ben Jones, poet and novelist. Ben’s first children’s picture book, The Curious Misadventures of the Sleeping Ant, is coming this November. Eva Blascovic, professional editor and author of the coming-of-age novel Beyond the Precipice. While you’re busy blog hopping, don’t forget to check out the Children’s Book Week Giveaway Tour – tons of great prizes to win! Previous Post: Children’s Book Week Giveaway Hop!